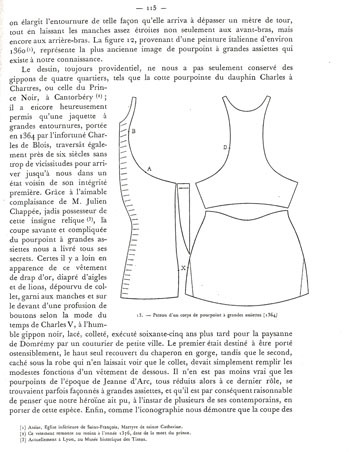 The silk fabric of the pourpoint of Charles de Blois was cut into an intimidating 27 pieces before assembly. 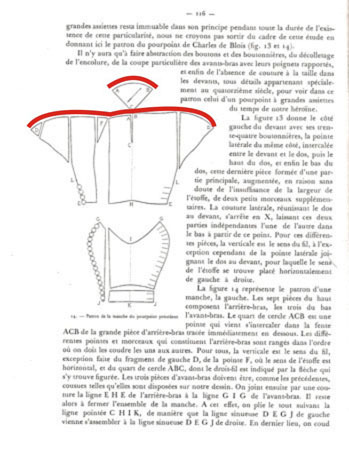 Upon consideration, its tailoring is not 27 pieces-worth of complicated, however, because many of those original pieces could have been combined — with no change to the shaping of the garment — had the fabric been wider. To be exact, the pieces of the garment could have been reduced to 18 with no change to its shape at all. I believe the overly-pieced cut is proof that the fabric was both narrow and scant in length. To this date, a detailed analysis explaining why the extra piecing was placed where it was has not been published. 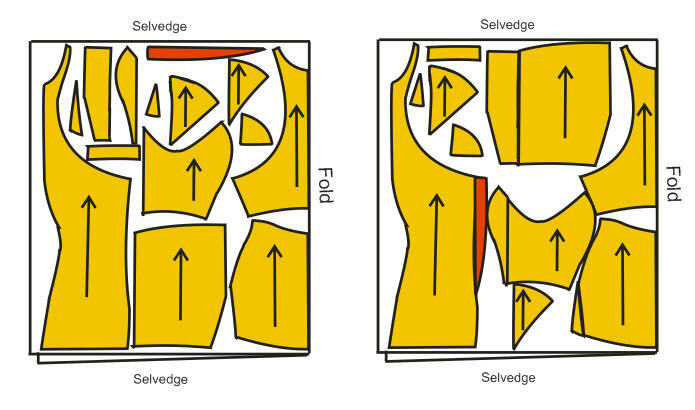 This article shows how the original pieces fit neatly into a layout on narrow, folded fabric while also revealing the original fabric’s width, which I extrapolated using the armhole measurement and a basic understanding of tailoring. 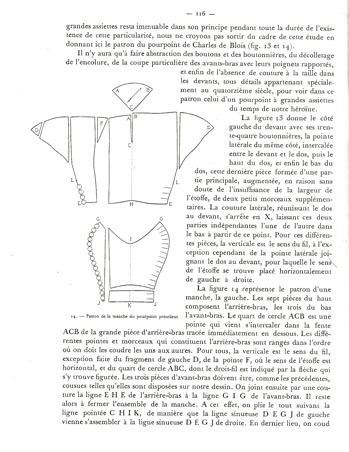 The pattern diagrams used as the basis of this study were published by Adrien Harmand in 1929 in Jeanne d’Arc: Ses costumes, son armure: Essai de reconstitution. 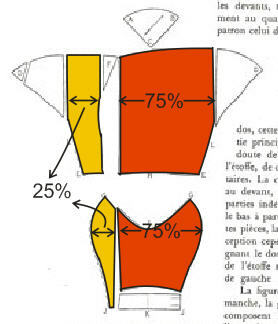 Of the various published pattern diagrams for this garment, I believe these to be the most accurate. I compared them with decent photos of the original and so far have not found any noteworthy discrepancies. Figure 1. Harmand, p. 113. The reason we can assume the fabric was too narrow is because the lower back slices would have been cut as one with the larger pieces, had the fabric been wide enough. 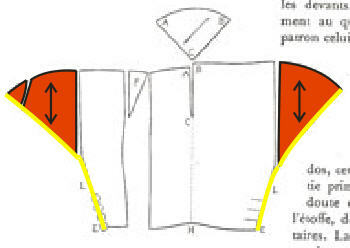 Some basic tailoring theory explains why. 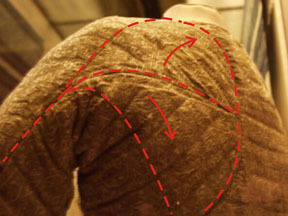 The seams that join the slices to the main lower back piece are created from two straight edges sewn together, both on-grain (for the most part; there appears to be a very slight slant in the figure above). 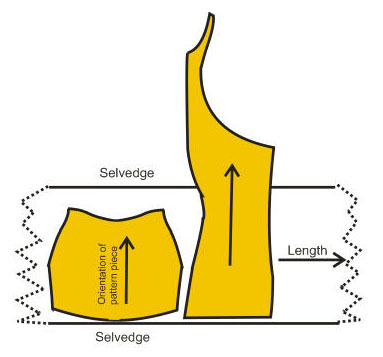 When fabric is joined in this way, it does not create 3-D shaping. It merely extends a flat shape. There is no benefit to sewing three pieces together when one would do. The obvious exception would be noticeably-different fabrics joined to create a visual pattern, but that is not the case here. Before going much further, I found myself wanting to know exactly how wide the original narrow fabric really was. 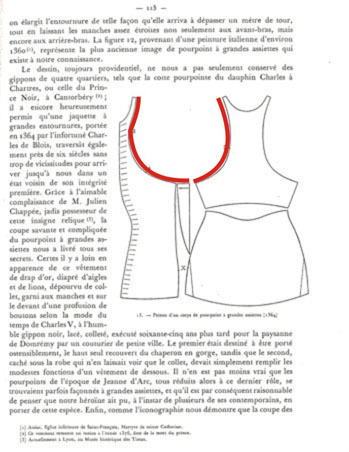 Harmand states that the grande assiette armhole measures 1.03 meters. With this one measurement, I used basic math to find the original fabric’s width. As mentioned previously, the widest of the body pieces is the lower back piece. 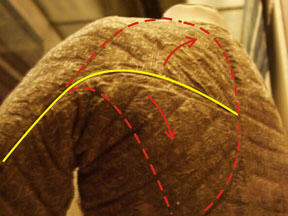 If its widest measurement were found, the fabric width could be guessed, probably within an inch of accuracy. 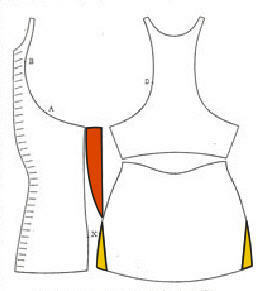 For practical purposes, rather than enlarge the diagram to match the life-size measurement, I measured the armhole circumference on the page-sized pattern, in inches. This number came to 4.5 inches. Then I measured the widest portion of the lower back piece, which came to 2.125 inches, bringing the lower back piece’s width to approximately 47% of the armhole circumference. 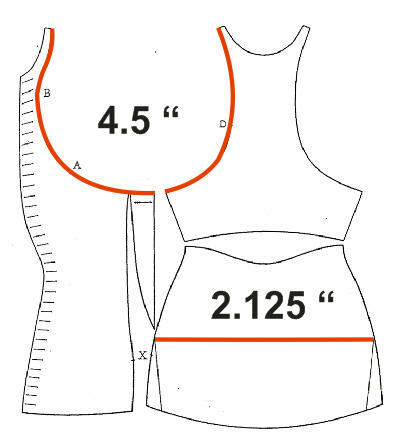 Reverting back to the metric system, I multiplied the original metric armhole circumference (103 cm) by .47 to find the widest width of the lower back piece. It came to 48.41 cm. In inches this converts to slightly more than 19 inches, which means the fabric was probably about 20-21 inches wide, if we assume at least a half inch of wiggle room near the selvedges. This allowed me to visualize the fabric folded lengthwise to a 10-inch width — seriously skinny fabric! Figure 14. Photo by Tracy Justus. Figure 15. Photo by Tracy Justus. Markup by Tasha Dandelion Kelly. It most likely was cut after everything else. It has been speculated that it was added after the fact purely as a correction for better fit, but as already explained, the front pieces were perfectly limited to the 10-inch width to take maximum advantage of fabric conservation. I believe the side slivers were intended as a planned part of the front pieces, not to correct a fitting mistake by the tailor. The total cut pieces in this garment numbered 27 by the end of the garment’s construction, but likely started as a set of 26 pieces. So there you have it — a full garment-worth of pieces crammed into less than three yards of 20-inch-wide fabric. To do this, the tailor broke the garment down into 26 pieces from a starting total of 18. Somewhere in the process of construction, however, one gore was pieced further, bringing the total number of pieces to 27 on the finished garment. What I have not done is proven every way it could have been cut. Proceeding from the premise that the fabric was narrow and then folded in half lengthwise, there were probably a number of possible cutting layouts. Variation would have likely centered around the order of all the smaller pieces placed in the spaces left by the main body pieces. 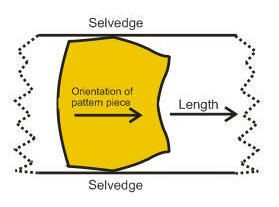 I performed this exercise to understand exactly why some of the non-tailoring-related piecing existed on the original. In seeking that answer, my respect for the original tailor and his clever approach to cutting precious fabric grew greater than it already was. * In all fairness, there is a very slight curve added to one side of the smaller upper sleeve piece. This was probably a fit adjustment added after the garment was assembled and fit on the body. Whatever it was, its effect is subtle and not enough reason for cutting both the top and bottom portions of the sleeve in multiple pieces. Arnold, Janet. “The Jupon or Coat-Armour of the Black Prince in Canterbury Cathedral.” The Journal of the Church Monuments Society VIII (1993): 12-24. Geijer, Agnes. A History of Textile Art. London and Totowa NJ: Pasold Research Fund Ltd, 1979.